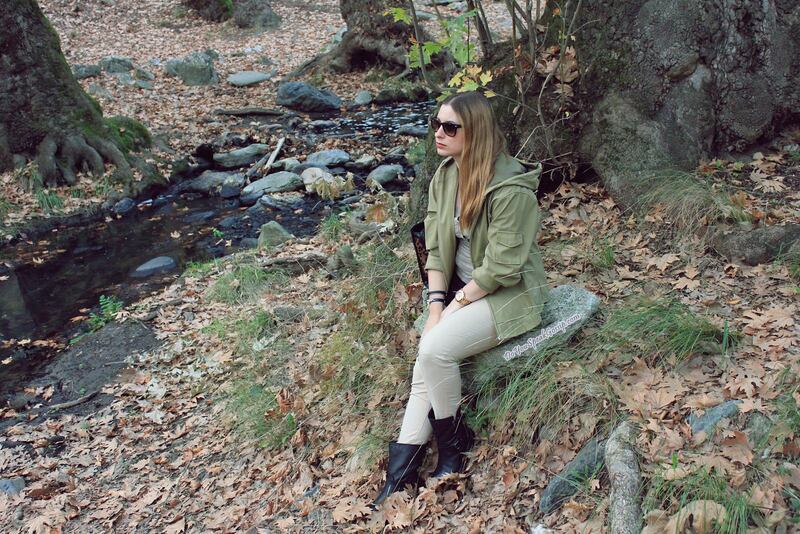 Military green & biker boots - Do You Speak Gossip?Do You Speak Gossip? 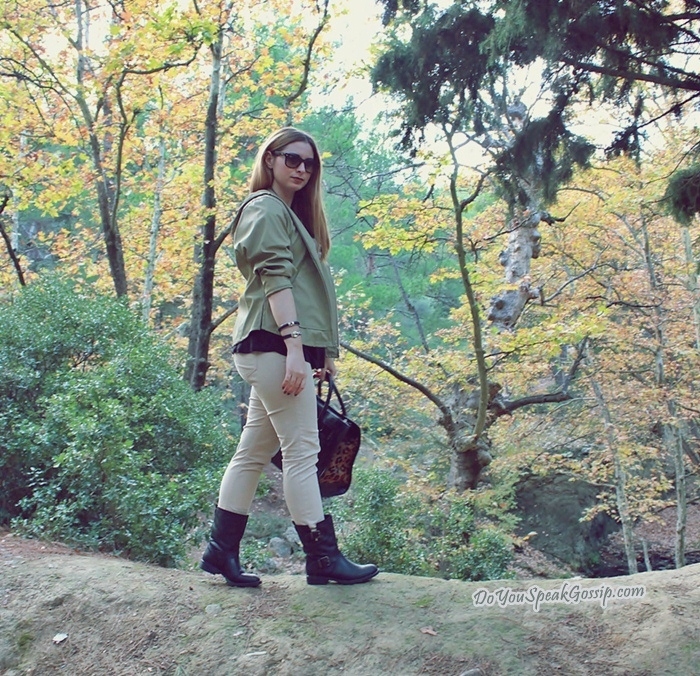 Khaki jacket: Visto Bueno (an old gift, I wore here for the first time), black top and jeans: Zara, khaki top: Bershka, bag: Zara, biker boots: Casual Attitude c/o online shop spartoo.gr, watch: Michael Kors, bracelet with green stone: gifted, other bracelet: vintage, sunglasses: Ray-Ban Folding wayfarers. I couldn’t wait to wear my new boots and put them to test to see how comfortable they really are, so I can take them with me in London. They seemed really comfortable, even in these uneven surfaces. This is my Shoe Save #35 for my Shoeper Shoe Challenge by Shoeperwoman.com, which puts my shoe collection to a total of 63 pairs of shoes. I want to thank T. for taking my pics once again! Den nomizw na einai to idio giati menw sti Thessaloniki! 🙂 Ena dasaki konta stin perioxi pou menw einai…. Mou thimise kati apo kalavrita na sou pw tin alitheia -oute kan ekei pou menw! Na kaneis pio sixna post ekei! ifigenia recently posted..MMM for H&M..I like..
S’euxaristw poli! 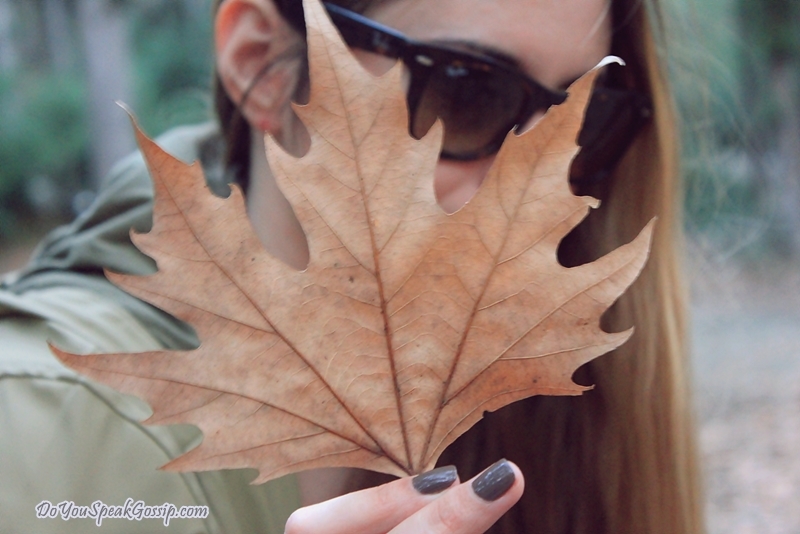 Exw kanei dio akoma post sto parelthon ekei…exei ta link tous s’auto to post! Xairomai pou sas arese toso! 🙂 Tha kanonisw na pigainw pio sixna! Πολύ όμορφο το outfit για την εξοχή.. Such a cute outfit. 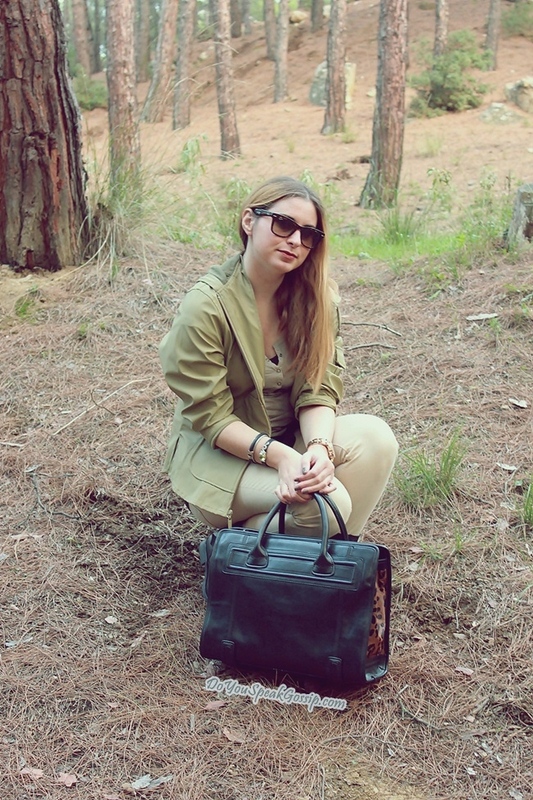 I especially love a hint of leopard with military style…it’s my favorite! Thank you! I thought it would look great with the military green. Glad you like it too. 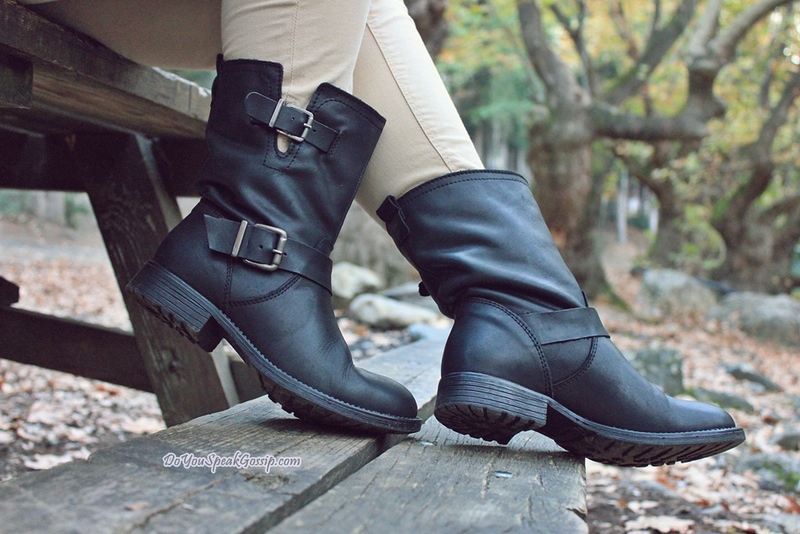 Ένα ακόμα stylish outfit!Λατρεύω αυτά τα χρώματα!και τα rider boots έχουν γίνει ήδη αγαπημένο “κομμάτι”πήρα και γω ένα ζευγάρι..είναι άνετα και ταιριάζουν με πολλά καθημερινά outfits! Maria recently posted..Lush collection!! Smell it!! Love it!! Opws ta les Maria mou! Kai egw gia ton idio logo tis agorasa, kai nomizw oti argisa poli! Xronia psaxnw to katallilo zeugari! S’euxaristw poli gia ta kala sou logia. nice pics + outfit, t did a great job! love the jacket m! Thank you! I thought so too! 🙂 I’m definitely wearing it again from now on. Classic combo with a bit of edginess. Great look! The backdrop of photoshot is wonderful. Ramona recently posted..Last chance to enter ArtBag Giveaway! Thank you Ramona! I’m so glad you liked it! I really liked the scenery! thea eisai filenada.sou paei apeira kai auto to style. S’euxaristw poli Eleni! Na’sai kala! Xairomai poli pou sou arese! Thank you Megan! Glad you do! Teleio look kai fwtografisi! Bravo! Polly wraio post! You look fabulous M!!!!!!!!! Kiss kiss!!!!!!!! Thank you soooo much sweety! Nice look, love the green, and what a marvellous place for a walk!!! the perfect background for your outfit! Love the boots…and you know, the bag!!!! k mou aresei poly ayto to outfit! evi mili recently posted..My FB Page is Here !!! S’euxaristw para poli Evi! Xairomai pou sou aresan. Love this look! Your bag is pretty fabulous, too. Nice boots!I really like the park! Thank you! It’s a really nice place, very serene, and reminds me of my childhood. les jolies recently posted..What are You? S’euxaristw poli Kate! Xairomai poli pou sou arese! S’euxaristw poli! Kai esi to idio! To military sou paei poly!!!! Ekpliktiki kai pragamatika agapw tin tsanta sou! I love how perfectly this outfit matches the beautiful setting: you look so pretty! I’ve been thinking of buying a pair of biker boots for a while now, but have been worried that they just won’t work with the rest of my wardrobe. I think you’ve inspired me to give them a try, though! You should definitely get a pair. You’ll get a lot of wear out of them. I’ve already worn mine many times. They’re really comfortable and perfect for everyday and casual outfits likes jeans and simple tops. And they can make an outfit less girly if you want it. I’m really satisfied with my buy! 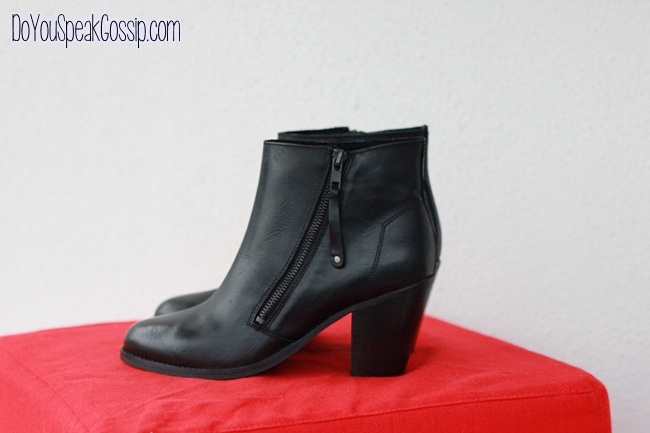 Pingback: Winter shoe essentials’ list via spartoo.gr | Do You Speak Gossip? Pingback: Fashion Room Service | The outfit | Do You Speak Gossip? Pingback: Heaven is a place on earth | Outfits | Do You Speak Gossip?